This blog is now located at http://bananastew.wilkinsons.com/. 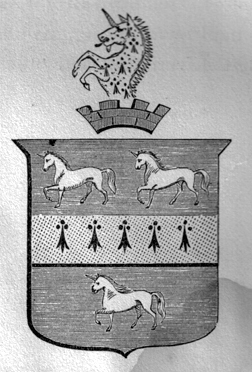 The latest addition to the Wilkinson Coats of Arms page is "Unicorns with a Horizontal Stripe (Design IV)", submitted by Armando Framarini. It includes an explanation of the source from an 1865 Wilkinson genealogy study. See! I've always said math geeks are really, really interesting once you start talking to them. Someone please alert the cheerleaders. The first movie I've ever tried on demand from Netflix through TiVo. I absolutely loved it (the technology, not the movie). The latest addition to the Famous Wilkinsons page is Norman Wilkinson. Norman invented dazzle camouflage (also known as Razzle Dazzle by the Americans) for use in World War II. Ships were painted with crazy colors and lines to make it more difficult for the enemy to determine their distance and direction of travel. Fascinating! Waking up at 3am is starting to be a bad habit. About 5 hours of sleep a night plus a nap in the middle of the day seems to be the new norm for my body. This should be interesting on my return to the US, especially since I don’t arrive with a weekend buffer to aid in the recovery. A day starting at 3am that is expected to not end for well more than 24 hours is probably not the best idea, either. In any case, I had time to get most of my belongings repacked into my suitcases before time for the morning 5:30am safari. The last safari was an eventful one. We came upon a young male elephant at a watering hole, and he felt necessary to stand in front of us and demonstrate – flapping his ears and lifting his trunk into the air - for a moment. There was no danger, but it was exciting. We later came into a family of elephants (including a very cute little baby elephant) walking down the road towards us. They weren’t planning to go around us, so we had to reverse to get out of their way. The big mother made a few nervous moves toward us, but nothing enough to alarm the guides. It was just exciting enough to be fun and a terrific and unique experience. We also got a call that the lone cheetah on the reservation had been sighted and got a chance to get a close look at him, too. At the coffee break, Lazarus picked us some wild mint to smell and told us about some of the native medicines that his mother had used from the bush. We stopped a few more times so that he could show us other wild herbs and plants. We even got to try a sour fig direct from the plant. It was ok, a bit tart, and with a nut in the middle that tasted a lot like an almond. After breakfast, I finished packing and the staff (Lazarus, actually) came and took my luggage to the car and brought the car around to the front. It was with a sense of sadness that Roelf and I left Etali to return back to the industrial world. In reality, 2 full days / 4 safaris was about the right amount to avoid too much repetition. I suppose if I’d been into the wines and spa experiences, it might have been worth another day, but the amount of time that I was gifted with was perfect. The ride back to Johannesburg was much like the ride up, with crushing poverty and awe-inspiring natural beauty. We passed platinum and chromium mines, people walking the streets in the Sunday best, innumerable signs for car washes and hair stylists, tons of construction in preparation for the 2010 World Cup, and a surprising amount of traffic for an early Sunday drive. We arrived back in Johannesburg about 7 hours before my flight, and Roelf #2 graciously took me to his home and let me fall asleep in his guest room for a few hours. Roelf’s house also serves as his wife’s veterinary practice, and the dogs greeted me warmly. The amount of security required at private residences and business is depressing, even for (or especially for) those that experience it every day. For anyone planning to visit South Africa, it is good to know that the airport has a huge variety of native artwork for sale, as well as a big selection of duty-free diamonds. Too bad I’d already bought my limit of gifts for this trip, but I’ll remember for next time. The plane had some problems with weight and wind and, apparently, the inability of anyone at Delta to perform some basic math, resulting in us taking off well after midnight. The plane sang happy birthday to one passenger who turned 11 while we sat and waited on the tarmac. Eventually, however, the plane took off and I left Africa behind. It was mangled a bit in editing (although the "mbps" instead of "megabytes" error is my own), and it's about 2 months late in being published (which makes the "last week at Cable-Tec" line a bit stale), but my latest XChange Blog entry is now published for my reader(s)'s pleasure. Enjoy, comment, and disparage as you see fit. After awaking in a quiet and dark room, it was marvelous to be able to relax, write, and read at my leisure. After a rushed week so far, it was refreshing and rejuvenating and prepared me for the next safari, which started around 4:30pm. The evening safari was highlighted by a gorgeous sunset with storms forming on the horizon and lightning flashing in the distance. There is nothing more beautiful in the world than the sight of an African sunset seen from the bushveld. Words cannot do it justice, and the pictures only tell part of the story. As we neared the end of the safari, the rain started coming down and we had to don ponchos for the final sprint back to the lodge. The rain didn’t keep it up for very long, and did not affect any roads the next day, so it was just another adventure to add to the memory bank. It was quite windy, so there is a lot of wind noise in the video. I apologize in advance and recommend you adjust the volume accordingly. After the safari, the lodge had a special dinner with multiple courses and a wine tasting/pairing. Since all of us guests now knew each other from the safaris, we all sat together at one table, which was very entertaining – especially as the night wore on and the wine glasses were repeatedly refilled. Everyone got along swimmingly, it was fascinating hearing the different life experiences and views, and we laughed late into the evening.